First, right off the bat, I apologize for the strong green color of the meal in this post. Ratatouille is typically pretty colorful, but the vegetables we chose for this particular instance of it were very green, resulting in a very green looking meal with some specks of red (the tomatoes). Ratatouille is a very flexible dish and can turn out a lot of different colors depending on the specific vegetables you use. If I had it to do over again, I’d probably include some red, orange, and yellow bell peppers to add more color… but it’s all tasty, nonetheless. Aside from being a Pixar movie, it’s a French stewed vegetable dish, to put it simply. You can use it as a side dish or as a main course (like we did), accompanied with bread or rice if you so choose. So, yes, this is an all-vegetable meal, acceptable to the vegans out there. You could easily accompany it with a protein if you wish – a chicken breast would go great with it. What vegetables are in ratatouille? Pretty much anything you have on hand works in ratatouille – garlic, onions, crepes, zucchini, squash, eggplant, bell peppers, tomatoes, carrots, radishes, and pretty much anything else that comes from the garden works in ratatouille. You can include the ones you want and exclude the ones you don’t want. 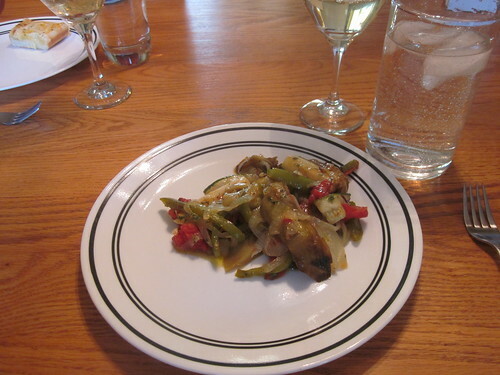 The “easy” way to do ratatouille is to simply stir fry them in order using olive oil. You want to start with the vegetables that require more cooking (onions and bell peppers) and follow it with vegetables that require less cooking (tomatoes). This is the way I’ve typically done it in the past. So, all you need to do is put a quarter of a cup of olive oil in a heavy pot over medium heat. Then, cut up and add the vegetables in this order: two onions, three bell peppers, two eggplants (in cubes), two zucchini (in cubes), four garlic cloves (minced), two pounds of tomatoes (chopped), and a tablespoon of fresh thyme and two tablespoons of fresh basil. 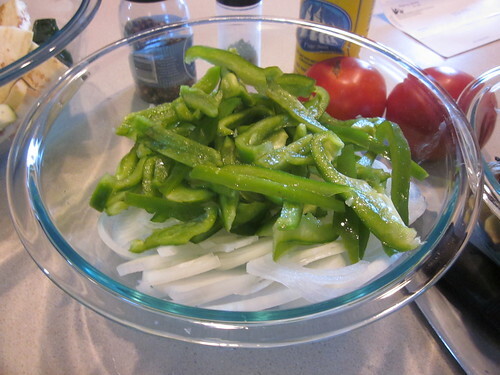 Add each vegetable before you cut up the next one and stir regularly. 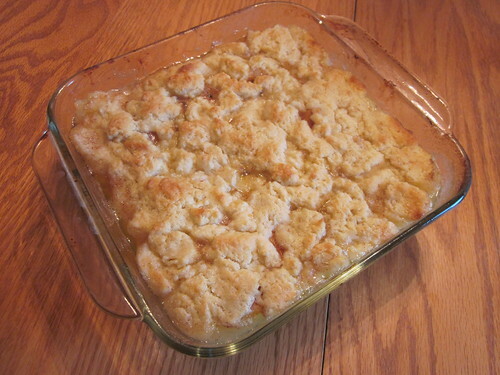 Then, turn down the heat until it’s just barely simmering, cover the pot, and let it simmer for about forty minutes. Of course, we didn’t do it the “easy” way. Instead, we broke out our copy of Julia Child’s Mastering the Art of French Cooking and decided to try her method, which was decidedly different. 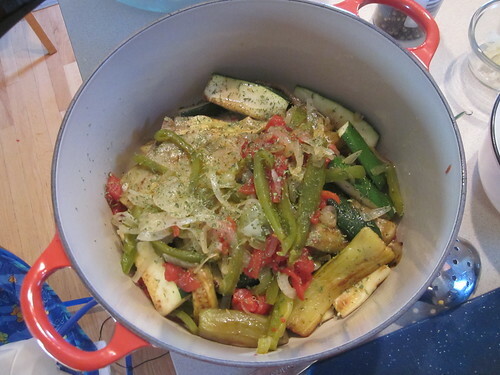 Her method of making ratatouille involves cooking each vegetable separately, then layering them in a pot. This actually looks more like what was prepared in the climax of the movie Ratatouille when done by a person with a lot of visual flair. In the actual movie, the dish prepared was confit byaldi, which has its own look but is basically the same thing. 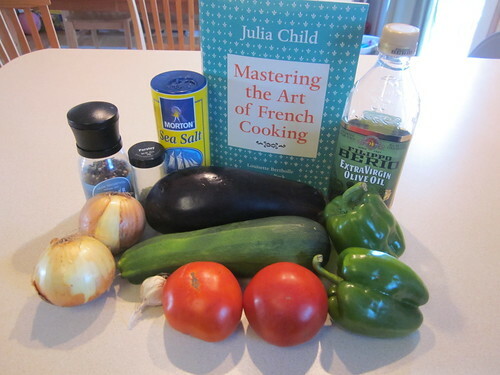 We based our procedure for making ratatouille on Julia’s method, so here’s what we did. Above, there’s onions, tomatoes, an eggplant, a zucchini, and two green bell peppers (again, I should have used yellow or orange or red to make a more colorful plate…). There’s also a garlic bulb (you could use garlic powder instead), salt, pepper, parsley, and olive oil. That’s pretty much all you need. The vegetables above are a mix of ones from our own garden plus items purchased at the Ames Downtown Farmers’ Market. Our total out-of-pocket cost was $5.25, according to my count (we were buying in cash at the farmers’ market and although I’m pretty sure I recorded everything, I’m not 100% positive of that). 1. We chopped up the eggplants and zucchini. We peeled them both, then cut the main bodies of each into strips that were about six inches long, 3/4 of an inch thick, and about an inch and a half wide. We then sauteed them over medium-high heat with a tablespoon of olive oil, a bit of salt, and a bit of pepper for about twelve minutes, setting these aside when finished. 2. While these were sauteeing, we chopped up the peppers and onions into thin strips. 3. We also blanched the tomatoes. 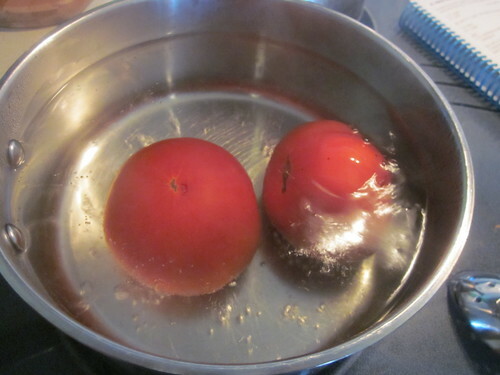 Blanching is simple – you’re just sticking the tomatoes in boiling water for about 20-30 seconds, then dipping them immediately in ice water. Why do this? It makes removing the skins from tomatoes very, very easy. All you have to do is cut a slice in the skin and the tomato slides right out of the skin. 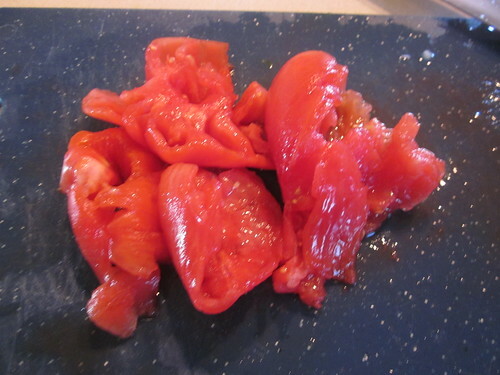 After blanching the tomatoes, we chopped them up as well. 5. We then sauteed the onions and peppers in the now-empty skillet for about ten minutes (adding another tablespoon of olive oil, a bit of pepper, and a bit of salt). After that, I turned the heat down to medium-low, put the chopped tomatoes on top, and covered the skillet for ten minutes. Why do that? This causes the vegetables to “sweat,” much like you would in a sauna. After the ten minutes are up, I basted off all of the extra water and turned the heat up just a bit. From this point on, the liquid that comes out of the vegetables is pretty flavor rich, so I cooked the vegetables for another five minutes, basting up any liquid that came out and pouring it on top of the pile of vegetables. At this point, it’s time to get out a small pot and actually assemble the ratatouille. All you have to do is layer the two bowls of vegetables you have right now and sprinkle some parsley in between the layers. Put 1/3 of the onion/pepper/tomato mixture on the bottom, sprinkle on some parsley, put 1/2 of the eggplant/zucchini mix, put 1/3 of the onion mix on top, sprinkle with some parsley, put the rest of the eggplant/zucchini mix on top, then put the rest of the onion mix on the very top, sprinkling with a bit more parsley. 6. Now, just cook it over medium-low heat on your stove top for ten minutes. You’ll want to kind of rotate it in the pan a bit so that it doesn’t stick to the bottom, but you also don’t want to upset the layers too much. Also, if you see any liquid, use your baster and spread that liquid out all over the top of the ratatouille. It was really, really good. My wife and I had it on an evening where the kids were visiting their grandparents, so we’re not sure about the “kid-friendliness” of it. However, we certainly enjoyed it. Leftover ratatouille has a lot of uses. I like to put it in with scrambled eggs and a healthy dose of hot sauce for breakfast. You can also use it as the base for a really wonderful chicken and vegetable soup. Use your imagination. 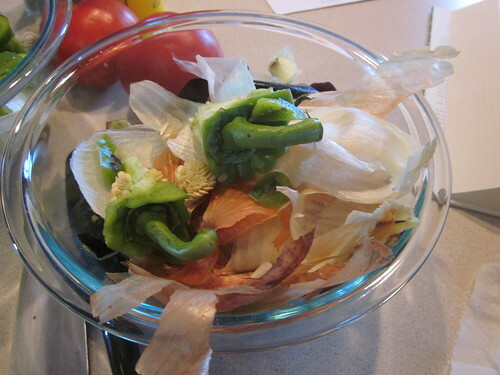 Also, the spare bits of the vegetables we used made an excellent addition to our compost bin. You really can make some wonderful stuff with just vegetables and a bit of imagination.